And so 50 hours later, I have finished my first playthrough of Dragon Age: Origins. What a game. It seems the number of traditional role playing games are decreasing these days. All the biggest and hottest games of the current generation are first person shooters. And so the RPG genre has adapted accordingly; rather than the tried and true style of RPGs from yesteryear, nowadays, more hybrid RPGs are being released. 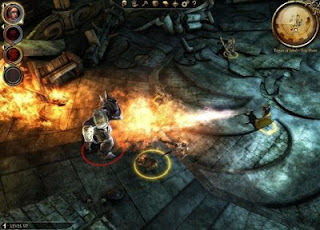 These games are primarily action shooters, but also combine elements found in RPGs (eg. Borderlands, Mass Effect, Fallout, etc.). I think that's why I was so excited for Dragon Age: Origins to come out. Though I love all sorts of games, RPGs are still where my heart's at. I miss this genre. I miss the dungeons, the dragons, the elves and the dwarves. Couple that with Bioware production, for me, solidifying it as a surefire hit. And you know what? They delivered. Sure there were some technical hiccups, but it never was to the point that it hurt my in game experience. The game takes place in a kingdom called Fereldon; a land filled with humans, mages, dwarves and elves. An evil force called the Darkspawn threatens to take over the kingdom, and it's up to the forces of good to stop them. 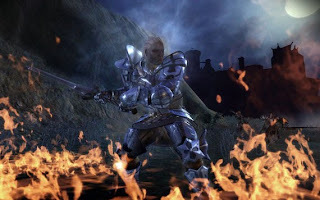 At the same time, there is dissension and threats of civil war amongst the kingdom's own people, where you, as the hero, are charged with uniting all the factions for a common good against the Darkspawn. What truly makes this game so engaging is the control you have over the story. At the core is an unchangeable storyline, but there are many ancillary stories that you have control over. The game is loaded with game changing and crucial decisions that you'll have to make. Many times you'll find that there are no right or wrong choices; you have to weigh out your options to find out which choice is the lesser evil. I also like how they changed the morality system as compared to Mass Effect. In Mass Effect, there was a Paragon-Renegade (good-bad) scale within your character. Make a good decision and you'll earn Paragon points; make a bad decision and your Renegade meter goes up. The good and bad decisions were generally obvious when the options were listed for you. In Dragon Age, it's different. Gone is the good-bad system of morality. Instead, there is a fondness system installed into your companions. The choices you're given in any decision are not clearly defined as good or bad, so the outcome relies more on how you want to drive the story. However, there are decisions you'll have to make that are approved by some companions and disapproved by others. While you may fight together, some of your partners may despise you based on your previous decisions to the point that they may decide to leave your party altogether. For some, this game can be dangerous. If you're a level 10 uber-nerd, the game can become quite immersive, with so much background stories, mythology and lore. There is so much optional text and literature that you can read through for those who want that full-on experience. And even if you're not that kind of a person (and I'm not, I think I'm level 5 nerd), you still need to browse through some of the literature for clues on how to go about some of your quests. The hero you create can be of any 3 races: human, elf or dwarf. Furthermore, you get to select a class, where your options depend on the race you chose: warrior, rogue and mage. Depending on what combination you choose, your origin story will vary. Through your adventures, you'll encounter many new companions who will aid you on your journeys, of which you can pick 3 to join you at a time. In combat, you're free to use any character in your party you choose, while the AI will control the others. For the most part, the AI is able to hold his own, although sometimes you'll find that one of your partners will go running off to battle the furthest enemy possible... a nuisance sometimes. Probably one of the most amazing things about the game is all the voice work. The dialogue in the game is superb; everyone's voice matches their character. And the vast amount of dialogue available is astounding as well. I think the most unfortunate aspect about this though is the lack of voice for your main hero. He's mute throughout the game, although you do get to select the dialogue that he would say. I think what really made Mass Effect work is that they did give Commander Shepherd a voice. It really helps the player connect with the character. I could go on and on, but I think I hit all the main points that I wanted to tackle. I really enjoyed this game. In my playthrough I used a mage, so I want to play through it at least two more times soon as the other 2 classes just to get a full feel for the game. But I've got a few things on my plate before I do that. That's about all for now, seeya later uber-geeks. It's interesting so far—very immersive. Definitely agree with you on the voice acting, and yes, my character could use a voice. Biggest factor for me is the story! Though they are digital characters, I find that I always try to not offend anybody and try to be diplomatic..., but man, they are so racist and abusive that it's impossible! This game's gonna stress me out..., it's awesome. Oh no. Keith will never sleep again. What have you done Jeff??? Between Bioshock and Dragon Age...I miss Keith. Feels like I haven't seen him in forever! Haha, oh, I'm so sorry. I'll make sure he arrives to the wedding on time.